Lyndie James and Jake Porter were best friends till Lyndie moved away with her family to California. Twenty years later, Lyndie’s back in town hoping to land a job exercising Jake’s Thoroughbreds to supplement her income as a children’s book writer and illustrator. While she’s much the same spirited, tender-hearted girl who cared for wounded animals and believed in God and miracles, Jake is calloused to the world after serving as a Marine in Iraq and suffers from PTSD. Jake is hesitant to let someone in, to allow someone to see the dark inner workings of his mind. Lyndie sees Jake as her next project, her next wounded soul to heal. As Lyndie prays for God to heal her old friend, she finds that getting close makes her vulnerable to hurts of her own. 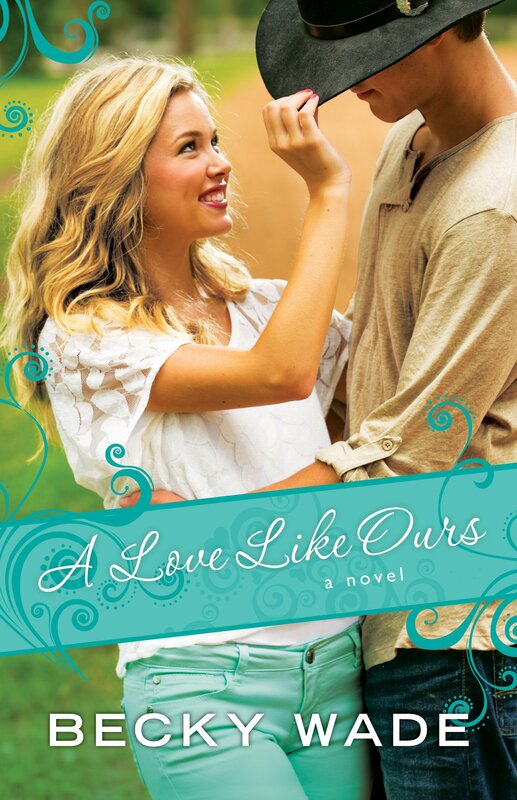 In A Love Like Ours, Becky Wade gives readers a meaningful story filled with personality, humor, and sigh-worthy romance. Many of the characters have great depth, including some endearing secondary characters like Lyndie’s downstairs neighbor, Amber. Readers will enjoy a smooth read with the unique backdrop of Texas horse country and insight into jockey life. Wade also shares insight into family dealing with sickness; Lyndie’s sister, Mollie, has had cerebral palsy since birth. So much of Lyndie’s faith is built from her experience watching her sister and her family trust God through all circumstances. Being Mollie’s sister changes who she is and how she sees the world, also enabling her to see past Jake’s stoic exterior. Jake Porter’s struggle with PTSD is a relatable story for so many readers; Jake lost his faith in the war, and thinks he doesn’t deserve God’s grace or anything good in his life. Jake’s faith journey though the story is a wonderful portrayal of God’s redeeming love. While Wade’s writing is descriptive, at times, the pacing sags with description and seemingly irrelevant storylines. For example, Lyndie and Amber force each other to go out on dates which brings a little more humor to the story, but some of the scenes seemed unimportant or too long. Overall, the book was evenly paced. A Love Like Ours is a fun, faith-based romance. If you’re looking for more than a trivial romance, this one’s a good pick. You get an interesting story, great characters, a picture of God’s faithfulness, and a “tall, dark, and brooding” Texan. Get your copy at Baker Publishing or at your local library! Wade, Becky. A Love Like Ours. N.p. : Bethany House, 2015. Print.